Louis XV baroque fashion 1720-1740. Home » Louis XV baroque fashion 1720-1740. Louis XV fashion 1720-1740. Grande robe. Justaucorps. Costumes Louis XV era. 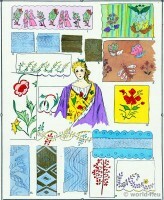 Baroque fashion 1720-1740. No. 1. Grande robe, after Watteau. This dress, with the enormously developed petticoat, represents the pannier at its greatest size. There had been panniers under the name of hoop or criarde in the last years of the reign of Louis XIV., hut it was not until 1716 or 1718, after the appearance of two English ladies at the Tuileries, that they look such a great extension. In this plate, taken from one of Parrocel’s pictures, the dress, falling from the shoulders without being drawn in at the waist, envelops the whole body; it is merely half open at the corsage, just disclosing the bows of ribbon of the corset. 2. Tight-fitting dress, with the petticoat looped upon a pannier à entonnoir covered with a shirt à campagne d’argent; black leather shoes; taken from the same picture. 4. Dress with a low body, tightly laced, plaited behind; after Bernard Picart. 5· Tightly-laced dress, plaited behind; after Bernard Picart. Until about 1750 women’s heed-dresses were low, consisting, for the most part, of a small lace cap with flaps on each side and coming to a point upon the forehead, or as in No.2, where the flaps are folded back upon the coif. – N. B. To observe, in figure No.3, the coqueluchon then called bagnolette and afterwards the Thérèse; the gloves extend up to the elbow, held by the fontage, as may be seen in No. 1. 6. Lady in winter dress trimmed with fur and in falbala, with muff and mantilla. toilette known as the négligé apparent; after Boucher. 7. 8. 9. Men’s dress underwent little change during the first half of the century. No.7 shows the coat Justaucorps, which was or first plain and with loose skirts, the cravat being also while. In 1725 the skirts of the coat were bouillonnés, so as to make them act as a pannier. This was effected by making five or six folds distended by paper or horsehair, and by the black ribbon worn round the neck, which gave rise to the frill which took the place of the former cravat. The wig was mostly worn, the hat being carried under the arm and serving to set off the carriage. The first illustration is after Bernard Picart, and the second after Lancret. 10. Colonel of the Swiss guard; after Parrocel. By Sabatier and Urrabieta. Imp, lith., Firmin-Didot, Son, & Co.
Louis XIV. , Louis XV. , Louis XVI., Baroque, Rococo, Directoire, French Revolution, Regency, Empire, Restoration or Romanticism fashion era. German Biedermeier. The Reign of Louis XV. 1715 to 1774. Reign of Louis XVI. 1780 to 1789. Timeline of the French Revolution 1789 – 1799. Les Modes sous la revolution 1792-1799 by Paul Louis Victor de Giafferri. Reign of Napoleon I. 1804 to 1814. France empire. Fashion in the Reign of Philippe. 1830 to 1848. Victorian era. Romanticism fashion. The Second Republic. 1848 -1851. Victorian era. “Second Rococo”. The use of the Corset in the reign of Louis XVI. Fashion under the French revolution 1789 to 1802. 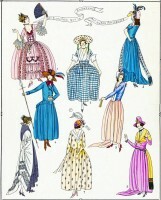 Paris fashion 1793 to 1795. French revolution. The Execution of the King Louis XVI. The Incroyables and Muscadins. The French directory dandies. Les Incroyables et Merveilleuses. Directoire fashion by Horace Vernet. Nymphs and Merveilleuses. By Octave Uzanne. Fashion in Paris after the Revolution. By Octave Uzanne. 1796-1800. The Gallery of Fashion. by Nikolaus von Heideloff, London. The Salon of Madame Récamier during the French Revolution. The Salons of Paris before the French Revolution. Caraco à la francaise in 1786. Fashion in Paris and London, 1780 to 1788. Historic hairstyles from Ancient times to the Empire. The Corset and the Crinolin from Remote Periods to the Present Time. Lace History. Reference List of Italian Laces. Colonial Costumes. 17th to 18th century. Broderies. Dentelles. 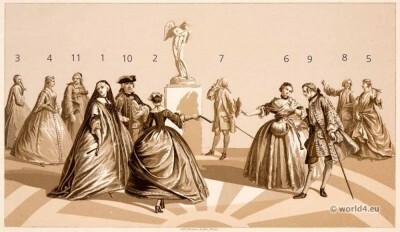 Les modes sous Louis XV. La mode du rococo. Mademoiselle de Chartres. Coiffure Louis XV. Regency Dress of plain muslin. Bandeau of plain muslin. Élégantes. Les Modes sous la Revolution 1792 - 1799. This entry was posted in 1720, 1740, 18th Century, Ancien Régime, Baroque, Court dress, France, Nobility and tagged Baroque fashion, Firmin Didot, Rococo fashion on 4/21/14 by world4.